The IAS aspirant should read current affairs topics and questions based on those topics every day. An IAS aspirant having such strategy of practicing current affairs questions on daily basis will also give an edge to the preparation for the IAS Mains Exam. As per the recent trend, most of the questions asked either in IAS Prelims or in IAS Mains Exam used to be associated with current happenings of national and international importance. Here, we have provided current affairs quizzes are most effective for IAS Prelims Exam 2018 but the topics covered in questions are also important for the IAS Mains Exam. 9. Recently, India has signed a MoU in the field of Judicial Cooperation with which of the following countries? 11. Which of the following is the Nodal Ministry of Election Commission? Explanation: Though the Election Commission is an Independent Constitutional Body under Article 324 of the constitution of India, Ministry of Law and Justice is the nodal ministry for the Election Commission. Election Commission supervises the Elections of Lok Sabha, Elections of Rajya Sabha, Elections of State Assembly, Elections of State Legislative Councils, President Elections and Vice President Elections. 12. As per the Economic Survey of India 2017-18, which of the following is not among the 10 New Economic Facts about India Economy? A. For the first time in India’s history, data on the international exports of states has been dwelt in the Economic Survey. B. The data highlighted another seemingly known fact that Indian society exhibits a strong desire for a male child. C. Extrapolating the data the survey indicated that growth in savings did not bring economic growth but the growth in investment did. D. The survey mentions that collections of direct taxes by Indian states and other local governments, where they have powers to collect them is significantly higher than their counterparts in other federal countries. Explanation: The following are the 10 Economic Facts of Indian Economy. 2. India’s formal sector, especially formal non-farm payroll, is substantially greater than what it currently is believed to be. It became evident that when “formality” was defined in terms of social security provisions like EPFO/ESIC the formal sector payroll was found to be about 31 percent of the non-agricultural work force. 3. For the first time in India’s history, data on the international exports of states has been dwelt in the Economic Survey. Such data indicates a strong correlation between export performance and states’ standard of living. States that export internationally and trade with other states were found to be richer. 4. India’s exports are unusual in that the largest firms account for a much smaller share of exports than in other comparable countries. Top one percent of Indian firms account only for 38% of exports unlike in other countries where they account for substantially greater share – (72, 68, 67 and 55 percent in Brazil, Germany, Mexico and USA respectively). 9. The survey mentions that collections of direct taxes by Indian states and other local governments, where they have powers to collect them is significantly lower than their counterparts in other federal countries. India has built up a fairly advanced agricultural research system. The Indian NARS is one of the largest systems in the world. 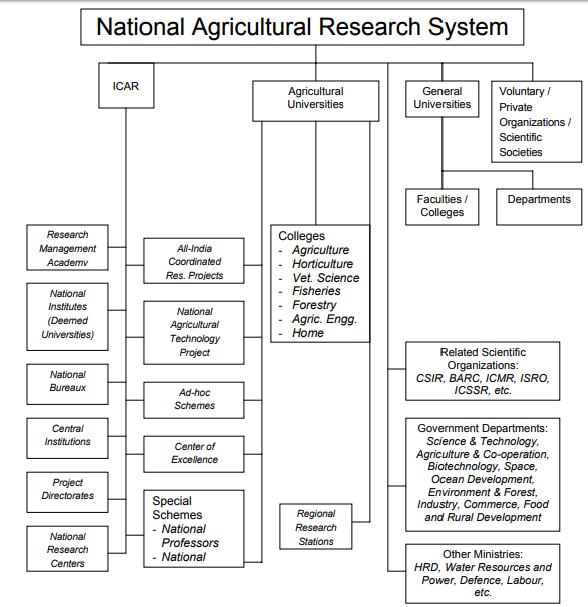 The present agricultural research system comprises essentially two main streams, viz. the ICAR at the national level and the Agricultural Universities at the state level. Besides, several other agencies such as the Conventional / General Universities, Scientific Organizations, and various Ministries / Departments at the Center, and also Private or Voluntary Organizations participate directly or indirectly in research activities related to agriculture. The ICAR directly administers 47 Research Institutes in the areas of crop, animal and fishery sciences. 14. When was the immunization programme was introduced in India? The programme gained momentum in 1985 and was expanded as Universal Immunization Programme (UIP) to be implemented in phased manner to cover all districts in the country by 1989-90. UIP became a part of Child Survival and Safe Motherhood Programme in 1992 Since, 1997, immunization activities have been an important component of the National Reproductive and Child Health Programme and is currently one of the key areas under National Rural Health Mission (NRHM) since 2005. Under the Universal Immunization Programme, Government of India is providing vaccination to prevent seven vaccine preventable diseases i.e. Diphtheria, Pertussis, Tetanus, Polio, Measles, severe form of Childhood Tuberculosis and Hepatitis B, Hiaemophilus influenza type b (Hib) and Diarrhea. 15. What is Rice Blast? C. It is a fungus that destroys up to 30 per cent of the world’s rice crop each year. Explanation: Rice blast is a fungus that destroys up to 30 per cent of the world’s rice crop each year. It is a disease that is hugely important in terms of global food security. 18. World's longest cave 'Krem Puri' discovered in which of the following states? 20. A little spacecraft of which of the following space agencies of the world will ascend on a Falcon 9 rocket of the SpaceX to go up in the space in the next month?